Welcome to our third free audio lesson covering Spanish for COPD. In the last premium audio lesson, the doctor explained the progressive nature of COPD and the need for regular pulmonary function testing. In this lesson, you will hear the doctor explain alveoli and blood gases. 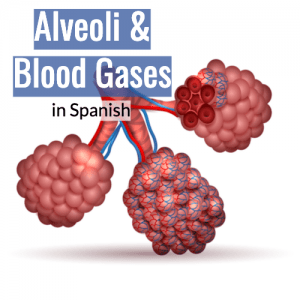 After the dialogue, we’ll review the description of alveoli and name the main blood gases in Spanish. Finally, if you would like to master everything the doctor said in Spanish, we cover it all in the next lesson for Medical Spanish members. This a more advanced lesson and members can log in and read along with the transcript. You can use the timestamps below to skip around the lesson and review. Let’s sum things up with a brief audio quiz! I will be joined by my friend Sonja, and we will be recording interviews and working on new clinical dialogues! We have covered respiratory symptoms, smoking history, and inhaler use in prior lessons. (A premium lesson, available through the Medical Spanish or Basic Medical Spanish memberships. In the premium lessons, we practice all the key vocabulary in this dialogue and then we will put that vocabulary to use as we interpret the dialogue between English and Spanish. This lesson is part or our full-access Medical Spanish Membership. Ángel Bahena is a Spanish teacher and a critical care RN. He helped me with the Spanish for this series and played the role of the doctor. You can take one-on-one lessons over Skype with Ángel. Ángel is originally from Mexico. …to pulmonologist Dr. Yaron Goldman who reviewed the clinical dialogues and advised us regarding essential information to cover at a patient’s first visit for COPD. The lessons offered at docmolly.com are a fun way to practice medical Spanish. They are not intended to teach medicine or provide medical advice. 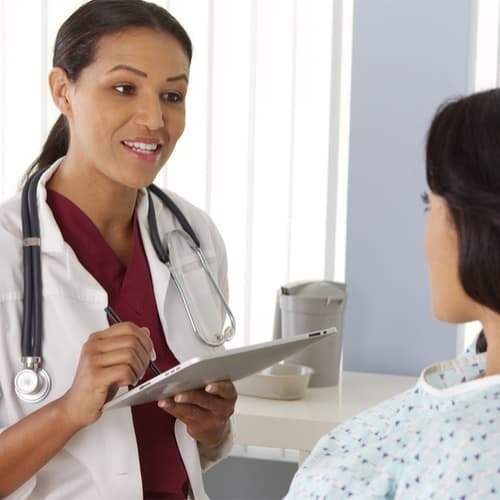 These lessons are intended to improve communication with Spanish-speaking patients, but they are not intended to substitute for a qualified medical interpreter.